The SOHO sun observatory caught this view of a large solar flare and coronal mass ejection (top of sun) erupting from the sun's surface early June, 21, 2011. The sun unleashed a powerful solar flare and eruption Tuesday (June 21) just in time for the summer solstice: the first day of the summer in Earth's Northern Hemisphere. The solstice solar storm occurred in the early hours of Tuesday and was spotted by the space-based Solar and Heliospheric Observatory (SOHO) operated by NASA and the European Space Agency, according to the website Spaceweather.com, which monitors space weather and skywatching events. "Magnetic fields above sunspot complex 1236 erupted during the early hours of June 21st, hurling a coronal mass ejection (CME) almost directly toward Earth," Spaceweather.com stated in an alert. "The incoming CME does not appear to be particularly potent; nevertheless, the cloud could trigger polar geomagnetic storms when it reaches Earth on or about June 23rd." 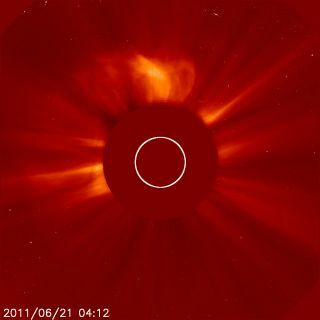 In one SOHO image from about 12:12 a.m. EDT (0412 GMT), the eruption can be see streaming out from the sun near the top of the frame, appearing like a bright crown over the star. The event coincided with the summer solstice on Earth — a time when the sun is at its most northern point in the sky — which mark's the start of summer in the Northern Hemisphere, as well as the first day of winter in the Southern Hemisphere. Class C7 solar flares are the least powerful type of flares. The more-powerful M-class solar flares are classified as medium-strength events, with intense X-Class flares topping the solar storm list. Coronal mass ejections are massive eruptions of charged particles and solar material from the sun's surface. Some of these particles are blown out into space, while others can rain back down onto the sun's surface. Earlier this month on June 7, the sun experienced a massive coronal mass ejection on a scale that stunned NASA scientists. That eruption was spawned by an M2-class solar flare. When coronal mass ejections are aimed at Earth, the charged particles they spew can interact with the planet's magnetic field to create dazzling auroras in polar regions. Extremely powerful solar storms can pose a danger to satellites and astronauts in space, as well as affect communications and power systems on the Earth's surface. The sun is currently in an active period of its 11-year solar weather cycle, with NASA and other space and weather agencies keeping a close watch on its activity with satellites and space-based observatories such as SOHO.